With 2015 coming to a close, I thought it would be the perfect time to share my favorite beauty discoveries of the year. This year I've come up with a mix of both specific products and more general favorites because I really tried a lot of new things this year. GLOSSIER | My ultimate favorite beauty discovery of the year is definitely all things Glossier. I tried the brand back in February (I wrote a review of the Phase 1 Set here and the masks here), and since then I've been a loyal follower. Every product is worthy of a rave, but I think the standouts for me are the Priming Moisturizer, Moisturizing Moon Mask, Balm Dotcom, and Boy Brow. BAREMINERALS COMPLEXION RESCUE | If you've read any of my posts this year, you've probably seen me go on and on about my love of light bases. My obsession with them really peaked this year, and the one I'm still reaching for over and over is the bareMinerals Complexion Rescue. It's the perfect balance of good coverage and a lightweight look and feel. It also leaves the skin with the most healthy-looking glow. HIGHLIGHTING | It's probably also no surprise that I couldn't pick just one highlighter and went for the whole category. My love for highlighters exploded this year, with my collection going from about two to almost twenty (see my Highlighter Roundup here). The standout cream product is the Clinique Chubby Stick Sculpting Highlight, and for powder it's the Anastasia Beverly Hills Illuminator in Starlight. SUNDAY RILEY LUNA | I wrote a review of the Sunday Riley Luna Sleeping Night Oil back in July and I'm still completely smitten with it. I use it about every other night and the results I see from it are better than ever - it really knocks out a lot of the redness and irritation in my skin. ANTIPODES MANUKA HONEY MASK | Another skincare standout this year has been the Antipodes Aura Manuka Honey Mask. This is raved about in the blogging community for good reason. It's probably my favorite mask because of its ability to soothe, purify, and hydrate the skin all at once. NEUTRAL LIP COLORS | 2015 was definitely the year of the "Kylie Jenner lip." I was wearing those pinky brown shades for most of last year, but I really became obsessed with them this year. If I show swatches to someone I have to swear up and down that they're all totally different. I just love that they're so flattering no matter what makeup look you're wearing. 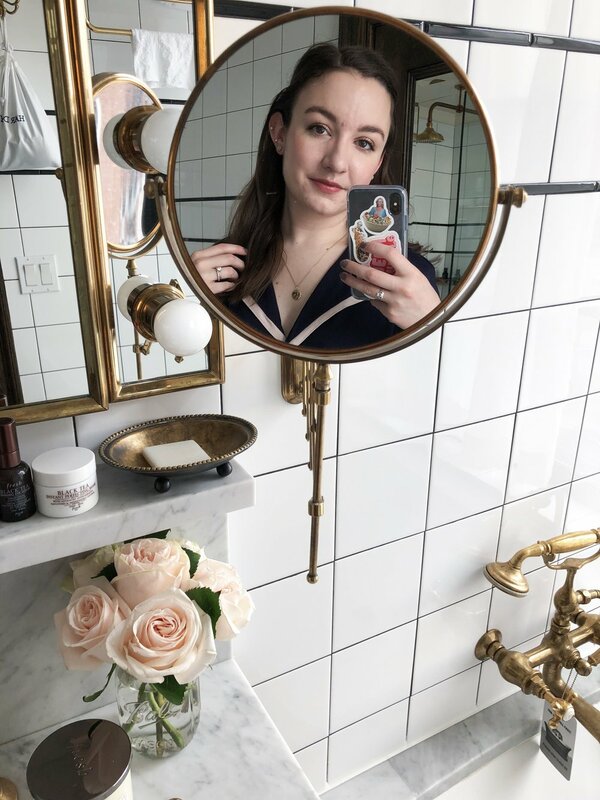 When I went to the Bite Beauty Lip Lab this past weekend, I of course made my perfect neutral (more on that on Saturday). MAYBELLINE FULL 'N SOFT MASCARA | If you follow me on Instagram I'm sure you'll have seen the Maybelline Full 'N Soft Waterproof Mascara show up in basically every single makeup of the day photo I post. It's such a good all-rounder that gently beefs up the lashes and makes them ultra-fluttery without making them look crispy. Plus it's only $8. BY TERRY OMBRE BLACKSTAR | Judging by my collection of eyeshadow palettes, I would have thought I'd pick more eyeshadow favorites from the year. But really the one standout has been the By Terry Ombre Blackstar in Misty Rock. The formula is the absolute best cream eyeshadow and the color is one of the prettiest I've ever seen. FRESH PETAL SUGAR LIP TREATMENT | This could have slotted into the neutral lips category above, but I've really used the Fresh Sugar Lip Treatment in Petal so much this year that it deserves its own mention. These have the loveliest formula, and the Petal color is the perfect mix of pink, brown, and peach. LIQUID LIPSTICKS | Again, a huge trend of 2015 was the liquid lipstick. I fell for them when I realized I could apply my lipstick in the morning and not have to worry about it through the rest of the workday. Of course I have mostly neutral shades, but it's the perfect way to wear a bold lip without worrying about it, too. My favorites are the Kat Von D Everlasting Liquid Lipsticks, the Sephora Cream Lip Stains (review), and the OFRA Cosmetics Long Lasting Liquid Lipsticks (review).